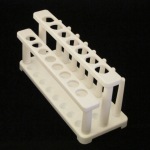 Polypropylene test tube rack with drying pegs. Length: 223 mm. Width: 90 mm. Height: 110 mm. 8 holes with 18 mm ID. 7 holes with 22 mm ID. 8 pegs with diameter of 10 mm and a height of 75 mm.